As the 2011 market continues to unfold, changing economic, political and social trends and influences continue to impact the multi-unit residential sector. Following the mass construction phase of the 1950s to early 1970s, the implementation of rent controls in the mid-1970s, the speculative run-up of the 1980s, the debt induced reckoning of the first half of the 1990s, the implementation of vacancy decontrol in 1998 and the emergence of rental market equilibrium in the mid-2000s, the apartment market has matured into a new phase. While ownership of much of the stock remains fragmented, a wave of consolidation has produced numerous portfolios held by institutions, pension funds, REIT's and private equity investors. In fact, nine REITs; Timbercreek, Boardwalk, Killam, Skyline, CAPREIT, Interrent, Mainstreet, Centurion and TransGlobe have amassed regional and national portfolios and the brands of Homestead, GWL, Morguard and Bentall are now prominent. Ownership by and the practices of these higher order stakeholders have established the investment stature of this asset class. With the apparent passing of the worst of the global economic crisis, the underlying strength of this sector has been tested and proven. Corresponding with the recession of the early 1990s, significant increases in the vacancy rate were recorded in 1991-92. Subsequent surveys revealed a return to marginal levels. Corresponding with the rising home buying tide, a shift in market conditions was apparent in 2002 with the vacancy rate peaking at 4.3% in 2004. The continuing decline in 2005-07 suggested that landlords accepted and responded to changing realities. By 2010, it appears that the recession has closed the homeownership drain on the tenant pool with equilibrium levels returning. A cursory view of Toronto's skyline has been a cause for concern for conventional apartments. 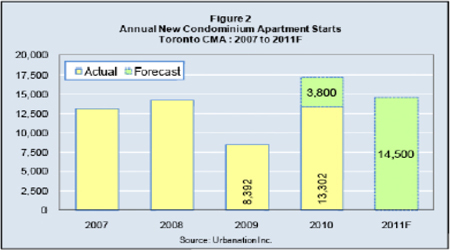 69,000 condominiums were constructed between 1996 - 2005 and the current development pace is in the range of 15,000 units. While this drains tenants from conventional rental apartments and the high proportion of investor purchased units presents competing supply, the ownership or rental cost differential remains as significant barrier. - Retention of the vacancy decontrol provisions of the TPA. - Annual guideline to be based on Consumer Price Index. - Rent reductions for capital costs no longer borne and reductions in utility costs. - Tenant favouring eviction process. - Limits on Above-Guideline-Increases for capital expenditures. - Prevention of rent increases where there are serious outstanding maintenance requirements or serious work orders. This legislation would have had a tremendous impact on TPA dominated thinking from 1998 - 2002. However, the impact of this legislation has been diffused by the reestablishment of rental market equilibrium. - The implementation of the value based property tax system (CVA). - Broad variations in natural gas prices. - The deregulation and reregulation of Ontario’s hydro market. - The amalgamation of municipal water providers. - Imposition of waste removal charges. - The imposition of HST. While volatility in utility pricing has become an accepted reality, astute operators have invested in measures and technologies to monitor and control these costs. Moreover, market participants have adopted practices that reflect a deeper understanding of these components. A substantial portion of the conventional rental stock was constructed between 1955 - 1970. By the early 1990s, deterioration and decay were evident in major component systems. Moreover, the effects of long-term sub-standard maintenance levels were quite apparent. A combination of factors including discipline enforced by lenders, building inspectors and fire departments, capital investment incentives included in the TPA and the demands of a more discerning tenant prompted landlords to initiate major restoration programs. Recognizing that these assets are irreplaceable, higher order landlords have also implemented restoration and upgrade projects that reflect their long-term view. These have typically included underground garage, façade and balcony restoration projects and energy conservation retrofits. In recent years, focus has shifted to elevator retrofits. While many buildings have outstanding requirements, the condition of the stock continues to improve. While a long tradition of private development, ownership and management continues to dominate, the industry has evolved. The emergence of institutional and corporate investors and REITs has enhanced discipline. Standards of professionalism have advanced in brokerage, lending and consulting practices. The maturity of the industry is expressed in organizations such as FRPO - Federation of Rental Housing Providers of Ontario and GTAA - Greater Toronto Apartment Association. Annual conferences and functions showcase the industry. While the dynamics of the multi-unit residential investment market continue to evolve, several longer-term themes have emerged. First and foremost, Stability: Though it has benefited in strong periods and has not been immune to downturns, the multi-unit residential sector’s performance remains relatively stable and consistent when compared to other sectors. In the industrial and retail sectors for example, changing physical requirements or fickle shopping habits can render an asset obsolete. Moreover, the loss of a single tenant can prove catastrophic. In the multi-unit residential sector, the essential form of residential buildings remains unchanged and risk is spread among numerous, roughly equal tenancies. The supply/demand imbalance: Despite the evolving challenges, many longer-term owners have recapitalized their buildings, streamlined and modernized operations and refinanced debt at very favourable rates. Few, if any would be in an unenviable position. Among more recent entrants, the inability to redeploy capital and achieve similar yields has reduced their temptation to take profits. Facing these entrenched owners has been a mix of traditional local private equity investors, domestic and offshore investors, corporate landlords and REITs as well as institutional investors and pension funds. This dynamic has fostered a competitive brokerage community and enabled brokers to orchestrate competitive bidding. Consolidation: Original developers retain large portfolios and smaller buildings are the subjects of intergenerational transfers. However, properties and portfolios that do come to market are increasingly acquired by an expanding contingent of REITS, corporate and institutional investors and large-scale private equity investors. Several portfolios exceed 20,000 suites with assets across the country. Capitalization rates hovered in the 10% range in the mid-1990s and declined to the 7% - 9% range following the introduction of the TPA. By the early 2000s, the leading edge was in 6% territory. 2002 saw a continuing release of properties. Despite rising operational challenges and uncertainty, the strength of the market was demonstrated by the absorption of several major portfolios. Demand continued in 2004, bolstered by the appetites of institutional, offshore and traditional private investors. Weak yields from other forms of investment hastened demand for small buildings from experienced and inexperienced private investors. Demand was underpinned by continuing low mortgage rates. By 2005, the prospect of rental erosion, rising vacancies and further pressure on operating costs would have been expected to exert upward pressure on capitalization rates. However, the disconnect between on-the-ground operations and the demands of apparently flush capital markets produced precisely the opposite result. If a capitalization rate of say, 7.0% was seen to be a threshold level in 2004, it had shifted from the floor to the ceiling by 2005. The continuing trend introduced the terms ‘frothy’ and ‘cap rate compression’ into the apartment market lexicon. Deals continued to set new benchmarks with capitalization rates for good suburban properties firmly in the 6% range. Continuing compression through 2006 and 2007 urged the threshold to 6%. This was certainly the case for prime assets where benchmarks were solidly in the 5% range and for premium properties where sub-5% deals were no longer surprising. The onset of the global economic crisis in the fall of 2008 and the onslaught of dire economic news through the spring of 2009 certainly affected commercial property markets. The impact was quite pronounced in the industrial and commercial sectors. However, there was an expectation that the multi-unit residential sector’s traditional strengths would support it through the crisis. While bumps and bruises were to be expected, positive fundamentals including strong rental demand, utility cost moderation and above all, the availability of low-rate CMHC insured financing would prevent a battering. While the deal flow certainly slowed, apartments remained the most liquid asset class through the crisis. With the arrival of fall 2009, a view that catastrophe had been averted and that the worst of the crisis was over appeared to have been emerging. While there was an expectation that apartment capitalization rates would succumb to broader upward pressures, deals done in the late spring, summer and fall of 2009 reflect rates that only tilt toward the upper ranges prior to the crisis. By the winter of 2010, normal trading volumes had resumed and apartment market participants seemed as confident as ever. With the arrival of fall 2010, concerns about a 'double dip' recession were gaining momentum. However, stakeholders may well take heart knowing that the fundamental strength of this sector has been tested and proven. As the 2011 market continues to unfold, it appears that a combination of forces will continue to reshape the conventional apartment market. In the shorter-term, pessimistic investors remain spooked and will likely linger on the sidelines. However, optimistic investors will be encouraged by the apartment market’s traditional strengths and in particular, its stability. To put this in perspective, 45-year old concrete apartment buildings look very attractive at time when the global financial system teeters on the edge of meltdown. Looking forward, conventional apartment fundamentals including the firming of the rental market and the availability of low-rate financing are favourable. While a variety of challenges continue to arise, owners remain in an enviable position, perhaps more so in the current environment. Sanford Mandel & Associates Inc.